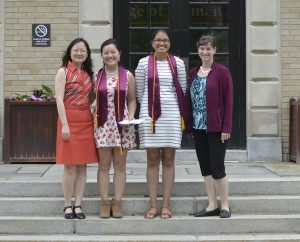 The Department of Human Development commended the graduating seniors of 2017 who made exceptional contributions to research and outreach. 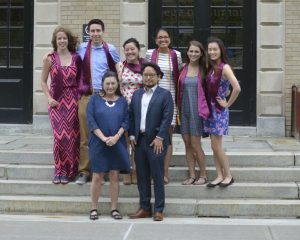 Ten graduating Human Development seniors received the Henry Ricciuti Award for having achieved "distinction in research, excellence in leadership, and/or have contributed to exceptional community and public service during their undergraduate career at Cornell University." Dr. Ricciuti taught at Cornell for 53 years and was an expert in the cognitive and emotional development of infants and children and mentored many students in human development. LaGrant, Assoc. Prof. Eve De Rosa, Prof.
Imitation and perspective taking have been studied extensively independently, but little research has examined how they can impact one other. The purpose of this study was to determine how one’s perspective on a model performing a behavior can impact how veridically the observer imitates the behavior, and whether individual differences in autistic traits can mediate this relationship. 57 young adults and 29 young children were randomly assigned to observe a model open a puzzle box from one of three perspectives (0º, 90º, or 180º relative to model). All participants then attempted to open it from the model’s perspective. Surprisingly, perspective did not affect success rate or overimitation, but did show an unexpected effect on reaction time in adults. As predicted, autistic traits score did mediate some outcomes among individuals in the 90º and 180º conditions. Lowtrait adults had significantly more success at opening the puzzle box than hightrait adults. Moreover, the perspective from which participants desired to open the box was accurately predicted as a function of autistic traits: high-trait children were more likely to choose the perspective they initially observed from, whereas low-trait children were more likely to pick another perspective. The findings suggest that although the perspective from which one watches someone else solve a novel task does not substantially guide task performance, individuals with high levels of autistic traits can exhibit, and might be unconsciously aware of, deficits in imitation and perspective taking. Key implications of these results are discussed. Thirty-two young adults were recruited on SONA, a Cornell University Psychology Experiment Sign-up system. They reported their five earliest memories and the properties of these memories (i.e. personal significance). Parents were then contacted to confirm these memories and dating estimates, and to provide any additional details. Consistent with the first hypothesis, these young adults postdated memories before 48 months and predated memories after 48 months. Furthermore, more dating techniques was associated with less dating error and the most frequently used techniques were seasons, school year, and landmark events, consistent with my second hypothesis. Finally, memories with landmark events were not different in dating error from memories without, evidence against the third. This study is the first to examine postdating effects in young adults. These findings have important implications on autobiographical processes. The literature suggests that the adoption and use of pain-management techniques varies across racial and ethnic groups. However, potential mechanisms for the observed differences remain unclear. The present study wished to determine whether the Theory of Planned Behavior (TPB) could predict the use of two types of self-management techniques, exercise and psychological strategies, among White, Black, and Hispanic older adults with chronic pain (n = 134). Thus, we examined participants’ attitudes, perceived control, implementation intentions, and usage of these two techniques as well as the influence of race/ethnicity on this model. The results were consistent with the TPB, however race/ethnicity only showed to be a main effect on exercise usage. The implications and limitations of this study will be discussed in order to provide suggestions for future research. 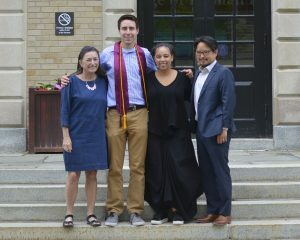 The following seniors received Honors in Human Development having completed original, empirical research, and wrote and defended a honors thesis: Anna Claire G. Fernández, Angel Khuu, Brian LeGrant, Sharnendra Sidhu, Leona Sharpstene, Hsiang Ling Tsai, and Deaven Winebrake. 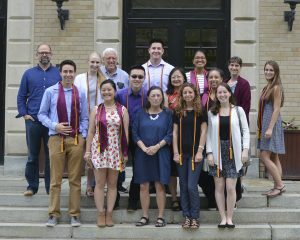 Congratulations to all of the 2017 Human Development graduates! Posted in Students in the News and tagged Adam Anderson, Angel Khuu, Anna Claire G. Fernández, Anthony Ong, Ben Zang, Brian LeGrant, College of Human Ecology, Corinna Loeckenhoff, Danielle Weinstein, Deaven Winebrake, Elaine Wethington, Emily Hagen, Henry Ricciuti, Hsiang Ling Tsai, human development, Janet and Joseph Zuckerman, Joanna Ezratty, Leona Sharpstene, Marcos Moreno, Qi Wang, Robert Sternberg, Sharnendra Sidhu, Urie Bronfenbrenner on June 9, 2017 by Allison M. Hermann, Ph.D..